In the workplace, the boss can come up with an idea which is very different and crazy in some way. It is out of the box and this idea is said by the boss to the employee. The employee doesn’t know at times how to react to such a comment or idea. He cannot give an accurate description at first and may have not even understood it properly. With the person not being ready to answer it will be very embarrassing. The boss might know that the person isn’t interested in the idea.So whenever such a situation arises in the workplace, they need to remember a few things. 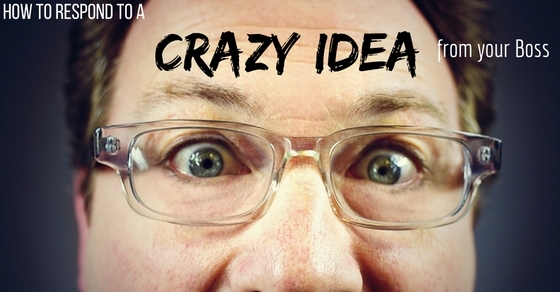 What to Do When the Boss Proposes a Crazy Idea? The crazy idea is presented to the employee by the boss. Immediately they need to give an answer and a positive one if they can. Though they aren’t prepared, but taking more time can worsen the situation. As the talk is face to face, the answer should be given instantly. If not, the boss thinks that the person isn’t agreeing with the idea presented by him. They may also think they haven’t heard the idea and aren’t familiar with the concept. Though the idea presented may be crazy, but it is a new idea. When the boss speaks of such an idea, they need to hear it entirely. They shouldn’t come to a decision at once. Hearing the idea as a whole gets them a better understanding of the idea. They can also understand what their boss may be thinking regarding the idea. So only after understanding and hearing the entire idea, they should give the needed feedback. There isn’t a boss who at first would like to know that their idea is terrible and won’t work. Telling them that the idea would be bad for the business may not be taken well. So at the start never be direct in criticizing or taking negatively regarding the idea. The boss will share and ask thoughts about the new crazy idea. But if the employee is very direct in answering, the boss may not appreciate it. So the initial and first response shouldn’t be direct criticism. At this initial stage, the thoughts of the boss aren’t as open as other employees. This idea is new in their head and so they will only think about the positive side and not the negative side. So the employee should know that they need to come to the same level as their boss, at that moment. By doing this, initially they can understand what positive thoughts need to be spoken. Later on they can plan their thoughts in detail for the future. This refers to speaking positive thoughts in the initial response. The idea is new positive thoughts regarding the idea needs to be conveyed by the employee to their boss. With this, the boss understands that they have the employee’s support. Then later on, the boss and the employee can think about the benefits that this idea can bring. Eventually they understand what can and what cannot be obtained by the idea. While discussing the new idea, the boss and the employee need to be at the same page while the discussion is going on. As it is the initial part of the conversation they both shouldn’t start contradicting each other. If they both stay on the same page, they both can come up with an alternative approach for this idea. If it isn’t favoured by the employee, later on they can give their feedback. But it should only be done after the boss and the employee are on the same page. Before coming to a conclusion, it is better to ask for more additional information supporting the idea. On doing this, the person can understand the idea in a much better way and then give their feedback. On doing this, it also acts as indirect stalling as the employee gets more information regarding the idea. And also at the same time they can think about the idea in their head till the information is being provided to them and respond in a much better way. There are a few people who are too direct in giving their responses. This may be because literally they may not be able to think about the idea in their head. So before responding something very direct and negative, know that the information supports any negative responses to be said. If they do not do that, the boss starts thinking that the person is too biased when they have to support their boss. The employee may also start thinking that it was a bad idea in being so direct initially. At times there are ideas presented by the boss by emails or any other format. So at this time the employee should realize that they have time in giving an answer. So they should take time in responding rather than immediately coming to a conclusion. They have time to understand all the facts and they can do it completely for some time. So if the employee has time in their favour, they should use it well and later on provide a valid response to their boss. Initially when a new and a crazy idea are presented by the boss, the employee doesn’t know anything much about it. So in some way they may be curious about it. Maintaining a level of curiosity always helps in understanding the idea much better. Knowing more information helps the employee in forming a much better response in their head. After knowing it, they provide their feedback to the boss which is better than an initial response for the future. For any kind of idea, to understand it better the person can do some self researching about it later on. It works for both face to face conversations or if ideas are presented by emails or phone calls. So it is advisable that research about the idea can be done later on after they know about the idea. They can even let their boss know that they will do some more additional research on the idea spoken. This will also make their boss know that the employee is interested in the idea. The boss can get self realization about their idea at any moment when they get the idea. It can also happen at the initial stage itself that it wouldn’t suit their business but chances of it are very low. The employee can ask their boss for more time to understand the idea. If the boss agrees on this, then they also might realize that they have discussed about the topic too soon. Knowing that the complete information isn’t gathered at the moment by the boss, they realize that they need to think about the idea later on. After hearing the idea completely, the employee will have some views which they may or may not want to share. So what they can consider doing is improving the idea. After hearing the crazy idea, they should try and replace the negative points by positive ones. Even if the positives are small they must bring and turn it into bigger ones. And so after doing this, they need to use it in their idea to try and improve it as it can be put to use later on in the future. If the entire research is done about the idea by the employee, they may even know that nothing much can be improved on the idea. So at this time they need to know that this idea is the only option available. So what the person can do is accepting that the idea is the best and only idea. They should also know that this idea is going to be used by their boss and they cannot do anything about it. What they can do is that in the future, they can see that it doesn’t turn into a big disaster if it isn’t successful enough. If nothing works in the end, the person can just be honest when they give their feedback to the boss. For doing this they should know that they have a very close relationship with their boss and both trust each other. On doing this by being honest, the boss understands that they have missed something important. So they would see if they can make some chances to the idea and realize that implementing such an idea would be very risky for their business. There should be a level of professionalism at all times whenever the boss and the employee are talking about something. This can arise when the responses between both of them are gentle enough even if the idea is new and crazy enough. So whatever the idea may be, the employee should respond to the boss in a gentle way. With this the boss realizes that the employee supports the boss’s decisions. The employee may want to give an honest feedback at the initial point itself to their boss. But before doing that, they need to collect all the relevant and necessary facts required to support their feedback. This can only be possible if a proper research has been done about the topic by the employee. The employee needs to first find out whether such an idea has been used in the past and how successful it has been. Only after knowing that, they should use such means for convincing the boss. As every idea coming in the boss’s head at first, it is a new idea and a proper knowledge about it isn’t yet entirely known. So the employee can try and convince their boss to wait for some time. As the idea is new it can be put on hold for a while. The employee can tell their boss to not use such an idea at the moment as it would be bad for the moment. Instead they can tell the boss to wait for some time or implement it at the time the company achieves a certain milestone. The idea is new and unproven at the moment. So before using it on a large scale, the employee should convince their boss to use it on a small scale first. With this the idea won’t be considered for the whole entire department but small groups for the time being. The boss can be advised to make a small group of members first. Even if the idea won’t work on these members the damage will be on a small group of members other than risking the whole entire department. So this kind of thing to occur in the workplace is natural and can happen from time to time. The boss would like to see progress in their business and so would want to bring up any new idea whether reasonable or crazy to their employees. But on this happening, it is important that the employee react in a positive way at the initial time. Later on when they have complete knowledge about the situation, they can provide their honest feedback. If it is successful enough, the boss can also consider it after understanding the situation entirely.